The new foot-activated Pet Fountain is taking the pet park in a whole new direction. This space-saving product was designed to draw more attention to the water and less to the actuator. Dog models agree that the new Model 350 provides a long drink of water for a thirsty dog. Built with the Most Dependable Fountains' integrity, it is ready to find a home in your local pet park. Choose from 17 colors to enhance your area with a blast of color and a clever addition. Many high school and collegiate soccer programs share facilities with football and other activities. In these cases, it is vital that portable soccer goals are compatible with permanently installed football goalposts. Bison makes it an easy fit. 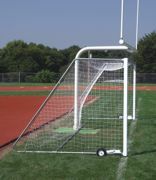 As of 2008, all official-size (24-foot by 8-foot) Bison Shootout Soccer portable goals are compatible with gooseneck football goals. Compatibility allows soccer goals to be placed in front of gooseneck football goalposts by repositioning the soccer goal's rear horizontal stabilizer bar. Now both sports can easily use the same goal line. This is especially critical for fields with permanent field markings. WaterRower US, a New England-based designer and manufacturer of patented commercial and residential fitness rowers, introduced Lean, Green and Made in AmericaTM , a pilot program to promote its American-made products while improving the health and conservation efforts of its employees and retail partners. The manufacturer only uses wood from replenishable resources where more wood is planted than is harvested. The equipment requires no electricity as the patented flywheel is propelled by water. Pentair Commercial Pool and Aquatics is now offering its popular IntelliChlor® in a new commercial grade for onsite chlorine generation. The Commercial IntelliChlor® electrolytic chlorine generator creates fantastic water quality without the drawbacks of manual chlorine additions with capabilities up to 2 pounds of chlorine per day. Facility managers only need pure water softener salt to provide chlorine sanitation with fewer chemicals to maintain water balance. The Commercial IntelliChlor® offers full diagnostic capabilities including cell life tracking as well as daily performance data such as product settings, hours of operation, chlorine output, cell cleaning cycles, salt readings and water temperature averages. Monsam Portable Sink announced a line of portable sinks that can be used anywhere needed with just the addition of water and an electrical outlet. Hot and cold running water, wherever and whenever you need it. Portable sinks are self-contained and mobile, and they come with their own water supply, either through a refillable tank or via hookup to a standard faucet. They are perfect for situations that require a temporary solution, for shared usage or for locations where built-in plumbing just isn't an option. Plastimayd announced an affordable enclosure for swimming pools—the Space Arena®. This air-inflated dome is made of a new, all-clear, durable, ultraviolet-resistant vinyl specially formulated so it won't discolor or lose resiliency in varying climates. The new Space Arena® has a transparent, straight wall design that provides an outdoor atmosphere with a spacious interior that allows full deck use right up to the wall. The Space Arena® is a low-maintenance, low-energy system, using a continuously operating, variable speed blower that functions on a normal 110-volt household current. This affordable, high-performing enclosure is ideal for smaller aquatic facilities looking to open sooner in the spring and stay open longer in the fall. The new Premium Hanging Club Mats from Power Systems provide the same comfortable feel and quality construction as Premium Club Mats, but they have two reinforced rings for hanging on a rack. Instead of stacking and rolling mats to store them out of the way, these mats hang easily on the Hanging Mat Rack, also available from Power Systems. Made with a supportive closed-cell foam structure, these 5/8-inch thick mats provide excellent cushioning for any activity. The nonslip, moisture-resistant surface is soft to the touch and wipes clean with a damp cloth. Available in 56- and 72-inch lengths in ocean blue and calypso berry. 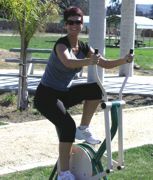 Throughout the nation, TriActive fitness zones, walking trails, outdoor gyms and other exercise areas provide high-quality, durable outdoor exercise products at parks, schools, university campuses, organizations, communities, hospitals, recreation areas, corporations, hotels and even cruise ships. TriActive's Outdoor Gyms offer a unique, environmentally friendly way to encourage everyone to improve their health through exercise. They need no electricity. The line includes cardio equipment, strength-training equipment and balance, flexibility and coordination products. All come with instructional decals and can be purchased individually or in an economical fitness package, such as the popular Universal Fitness Trail.